« Seriously, why not outsource TSA ops to Disney? Why does Disney collect fingerprints in the first place? The company line is that it’s strictly for fraud protection … to keep people from passing their (expensive) tickets (or Magic Bands) on to somebody else for re-use. It’s less of a day-pass problem … more of a multi-day ticket problem. For example, somebody buys a multi-day ticket at a deep discount, uses the pass for a couple of days and hands the pass over to someone else to use for the unredeemed days. Both the initial buyer and resale buyer benefit from the deep ticket discount. Technically, that’s fraud and certainly not what Disney intended … the discount was aimed at getting the initial buyer to spend more days at the park. I’ll buy the explanation, but I score it as “plausible”, not certain. There’s a big assumption that underlies the stated rationale. It’s implicitly being assumed that both the initial buyer and the resale buyer would come to the park for one (or multiple days) if they had to fork over list price for their tickets. Simple example: assume that a day pass costs $100 and a 5-day pass costs $250 – half the price of 5 daily passes. The fraud loss argument says that Disney loses $250 in revenue if the initial buyer uses the pass for 3 days and then sells the remaining 2 days to somebody else. That’s only true if both the initial buyer and resale buyer would come to the park if they had to pay list price. Maybe they’re very price sensitive (e.g. budget constrained or just plain cheap) and stay home if ticket prices are more than $50 per day. If that’s true, Disney loses $250 … the price of the 5-day ticket. Plus, Disney captures “ancillary revenue streams” … in park spending on food, merchandise, etc. If the 2 ticket-sharing buyers stay home, Disney loses more than the price of the 5-day pass … it also loses the potential in-park spending. Sure, Disney would prefer to 5 daily passes @ $100 and get 5 days of associated in-park spending. Next best is to discount the 5-day pass and get the 5 days of associated in-park spending. But, it’s not clear to me why Disney would care that much whether the 5-day pass is shared. Again, if both ticket-sharers are price sensitive, Disney risks losing both the ticket revenue (albeit discounted) … and the in-park spending. Disney is smart and knows that. To me, the downside is potentially greater than the fraud-protected upside … which is why I score the rationale as plausible but not certain. 1) Broad-scale ticket fraud … e.g. some evil-doer hacks a Magic Band ID code and spreads it like wild-fire so that a large number of counterfeit Magic Bands can be scanned to enter the park for free. 2) Link kids to parents … when kids under 13 enter the park, their fingerprints aren’t scanned, their parents’ prints are. This is the Chuck E. Cheese model – trying to make sure that kids leave with the adults that brought them in. Couple of holes in this rationale: (1) no verification that the accompanying adult is a parent or other legitimate chaperone, and (2) no check at the exit gates to match kid to parent. 3) Government data collection … Disney has digital “personas” associated with the Magic Bands and collected fingerprints. So, one can easily imagine how the information could be used to identify and track persons of interest. Fueling this type of speculation, there are historical reports on How the CIA Helped Disney Conquer Florida. Disney adamantly denies any sort of nefarious, surreptitious use of the data … i.e. nothing passed along to the Feds. Coming: A closer look at the “how” of Disney’s fingerprinting … the supporting technology. This entry was posted on April 16, 2019 at 6:59 am and is filed under Uncategorized. You can follow any responses to this entry through the RSS 2.0 feed. You can leave a response, or trackback from your own site. 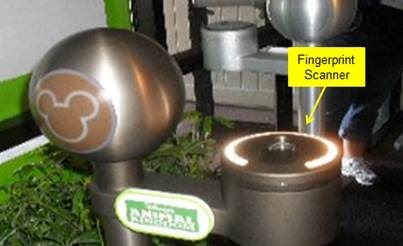 Re the fingerscanning at Disney … when we lived in Florida we bought annual passes, which let us economically drop into multiple Disney parks for brief visits, frequently. Each time, we had to badge in and insert fingers to verify that our identity matched the passholder. Disney’s execution on queuing was amazing, even before Magic RFID bands. The lines entering Disney flowed so smoothly, but I noticed finger scanning on my phone was comparatively so inconsistent, often requiring multiple scans, even with practice. Curiosity grew, so I swapped passes with my unaware spouse, then watched. Our mismatched passes/prints SHOULD have set off alerts on entry … but didn’t. Ahah! Maybe Big Brother Mickey has improved that tech by now, but doesn’t it make you curious?